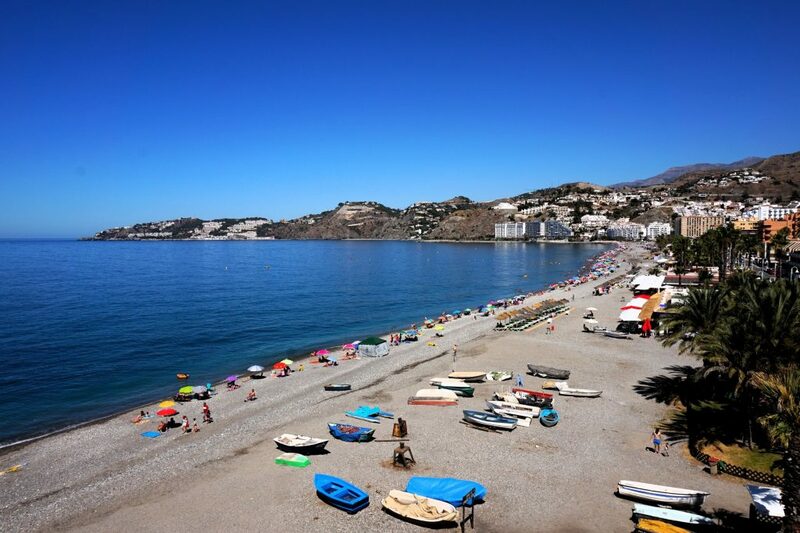 Though often overlooked in favour of nearby Nerja, the charming ex-fishing village of Almuñécar, on Granada’s coastline, is perfect for a day’s sightseeing or chiringuito-hopping. Situated on the ‘Tropical Coast’ just an hour’s drive south of Granada itself, Almuñécar is not just about the beach, though: read on for the 10 best attractions in this little-known, yet beautiful town. When Civil War broke out in Spain in the summer of 1936, the English writer and Hispanophile Laurie Lee (1914-1997) was living in Almuñécar. The then-quaint little fishing village was the subject of the final chapter of Lee’s “As I walked Out One Midsummer’s Morning” and immortalised as “Castillo of the Sugar Canes” in “A Rose For Winter”, written in the early 1950s after Lee revisited Andalusia. The monument to the writer that was unveiled on the Paseo del Altillo in 1988 sits under a palm tree at the end of a row of trendy beach bars and is fairly easy to miss – despite the fact that it would be “indelicate” to specify what it resembles, as Lee joked when he saw a photo of it. Lee rather uncharitably wrote in 1952 that Almuñécar’s Old Town, which extends up a steep hill away from the ocean, was “grey, almost gloomily Welsh”. If that was true back in the early 1950s, then this neighbourhood has obviously been spruced-up since: today, it is a charming and colourful quarter of steep lanes and whitewashed houses, many of which are decorated with geraniums and jasmine. Friendly locals sit outside their houses and exchange gossip as cats, dogs and children play around their feet – as much a defining scene of Spanish street life now as it was over half a century ago. It’s a bit of a climb to the top, so make sure you have a bottle of water with you – but the views out over the bay are well worth the effort. 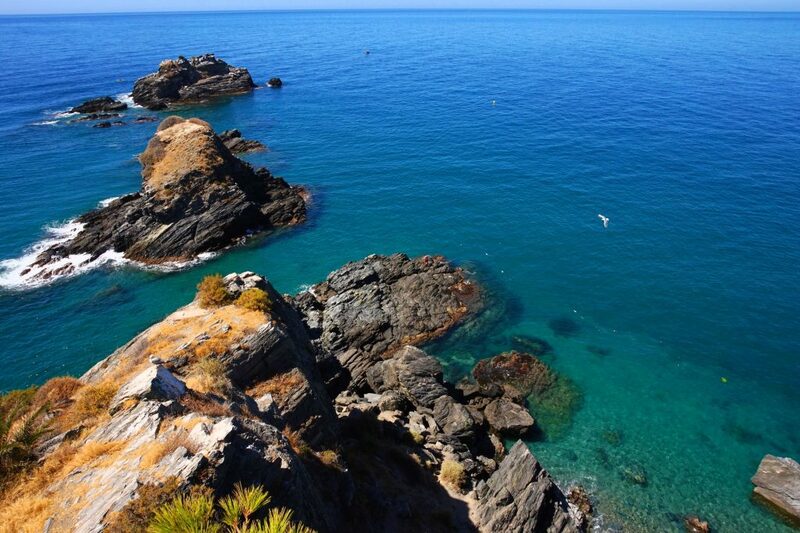 The beaches along the coastline of Granada province aren’t as attractive as those in neighbouring Málaga: they tend to be of pebble and rock rather than fine sand and black-grey rather than yellow. Almuñécar’s main beach, Playa Costal Tropical, is no exception and when first seen is a rather unappealing curve of dark sand backing onto high-rise apartment blocks. But as the brilliant blue water suggests, the bathing here is wonderful and the beach is often less busy than those further west along the coast, so you have more space. The rocky outcrops that protect the beach on either side are also great for snorkelling and exploring, whilst a row of smart, buzzing beach bars is just a two minute stroll away. On the western flank of Playa Costa Tropical are Paseo del Alitillo and Paseo de la Calatilla, two lively promenades lined with chiringuitos catering for every taste. Some are the kind of places you’d expect to find on Marbella’s blingtastic Nikki beach (think white leather sofas and nightclub-style interiors), while others favour a more rustic, hippy style (think wicker awnings, sandy floors and the faint but distinct aroma of weed). There is a charming, alternative ambience to the beach-bar scene in Almuñécar that distinguishes it at once from the tourist magnets along the Málaga coastline. Friendly service and excellent seafood-tapas make these sea-front promenades perfect for a lazy afternoon in this lovely ex-fishing village. It might not promise an authentic Andalusian experience, but the aquatic theme park located just along the coast from Almunecar’s main beach is great fun. The only salt water aqua park in Spain, Aquatropic’s rides, slides and attractions will entertain adults as well as kids for hours. Water park classics such as the Zig Zag, Kamikaze and Wave Pools are on offer alongside amusements with rather more tantilising names: Black Hole or Whirlwind, anyone? When you need a break from the water-themed larking about, there are plenty of places to head to refreshment, including a self service restaurant and bar and a waffle kiosk. 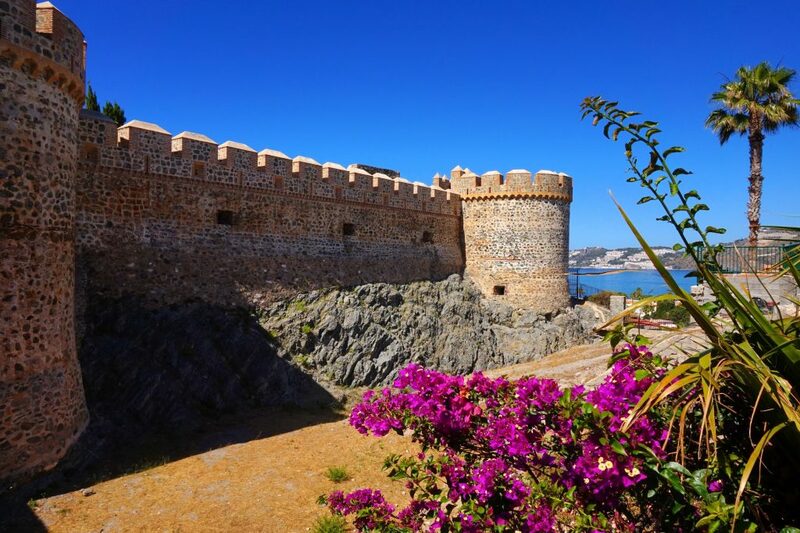 Although there has been a fortress in Almuñécar since Phoenicians occupied the city, the structure we see today dates mainly from the town’s Moorish period, between 755-1489. It was heavily damaged during the Napoleonic Wars and from 1830 was used as a cemetery for over 130 years before restoration work on the castle began in 1986. Though it continues at intervals, the bulk of the reconstruction has been done and the outer walls, in particular, are stunning. The castle also houses a small but interesting archaeological museum containing artifacts from different periods of its history and offers impressive views of the rocky coastline beneath its walls and turrets. The path that leads down the side of the San Miguel castle and back into town brings you out into the small but lovely Majuelo Botanical Gardens. This shaded, verdant little paradise is home to more than 200 species of sub-tropical plants, trees and flowers from all over the world. Particularly noticeable as you wander around these immaculately-maintained gardens are the Sabal Palm (from Cuba and Florida) and other varieties of the same species from Central America, the Philippines and New Zealand. Refreshments and souvenirs can be purchased from kiosks named after famous Andalusian cities such as Seville and Granada. At the western end of Almuñécar’s main beach is an outcrop of rock known as the Peñón del Santo. If you’re up for a gentle climb, you can take the steps to the top of the Peñón and enjoy spectacular views of the beach and the rocky coastline from the mirador (viewpoint) at its peak. As they do on bridges crossing the Seine in Paris, visitors sometimes fasten padlocks onto the iron bars surrounding the mirador, whilst others have marked their visits by carving their names into the rock that faces out to sea. The giant cross at the northern tip of the viewpoint signifies the return of Christianity to Almuñécar, which was reclaimed from the Moors in 1489. It was only in the last century that further remains of a Roman aqueduct were discovered in the centre of Almuñécar. As previously discovered sections indicated, this impressive structure once began about 8 kilometres to the north of the town in the Torrecuevas region, snaking down through a valley between the Verde (Green) and Seco (Dry) rivers. It was built in the first century BC and is believed to have been crucial to the Romans’ fish-salting factories in Almuñécar (see below) as well as for hygiene and cooking. Though the small section in the city centre is the most convenient to view, there are larger stretches out in the beautiful valley of the Verde River, about a 20 minute walk out of town. Situated in the shady haven of the Majuelo Park are the foundations of fish-salting pits built by the Phoenicians and enlarged during the Roman occupation of Almuñécar. During the town’s Roman epoch – when it was called Sexi – the delicacies produced in these fermentation chambers were highly sought-after all over the Mediterranean. Perhaps the most coveted product of all was a fish paste known as Garum: it was made by soaking the innards of fish in sea water then allowing them to ferment, resulting in a kind of thick sauce that was believed to have all sorts of restorative powers. You can only image how dreadful it must have tasted – yet the remains of what was obviously an extensive fish-salting factory in Almuñécar tell you how big a business Garum and similar concoctions once were.